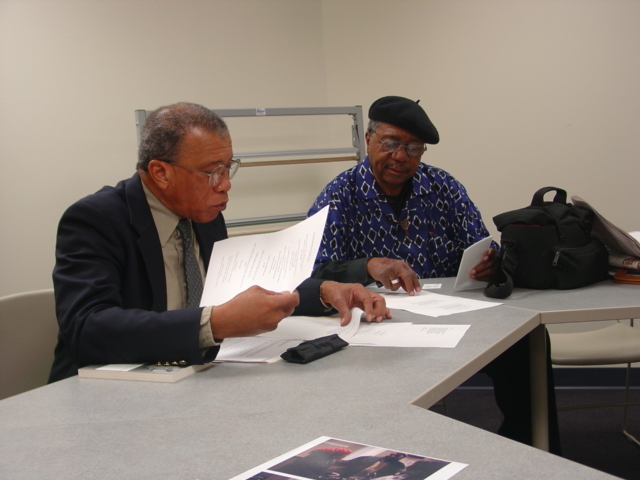 Jerry W. Ward, Jr. and Eugene B. Redmond prepare for discussion of Langston Hughes in East St. Louis (Feb. 2005). It just occurred to me that although I typically write about my interactions with college students concerning literary art, I have in fact had the luxury of having a rather extended conversations about poetry with a group of 4 black men over the last 10 years in particular. Taken together, the extended exchanges I've had with Jerry W. Ward, Jr., Eugene B. Redmond, William J. Harris, and Tony Bolden have given me a really expansive view of the histories of American and African American poetry. Usually, I communicate with Dr. Ward by email and on the telephone about poetry. I rap with Bolden and Harris on facebook, and I have marathon conversations with Redmond at his home in southern Illinois. A couple of weeks ago at the institute on poetry at the University of Kansas, I got the chance to catch all 4 of them in one common place. On the one hand, I felt like I made the most of it by talking to each of them about multiple poets, notable news, and various developments; at the same time, I left feeling like we still needed to cover so much more. I met Dr. Ward back in 1996 when I was a second-year student at Tougaloo College in Mississippi, and I met Professor Harris in 1999 when I began graduate school in English at Penn State (where I also worked with Bernard Bell and Keith Gilyard). When I met Ward and Harris, we were talking about poetry almost immediately and haven't stopped since. I met Bolden at a conference toward the end of my time in graduate school, and Redmond became my faculty mentor when I started teaching at SIUE in 2003. Strange as it seems to say, Redmond and I talked at least one substantial conversation everyday, Monday through Friday, about poetry or some aspect of black artistic culture during my first several months at the university. By the time I met him, he had already taken over 100,000 photographs of artists and cultural figures, so I had a lot of catching up to do in order to become familiar with the treasure trove of visual history related to black poetry that he had created.